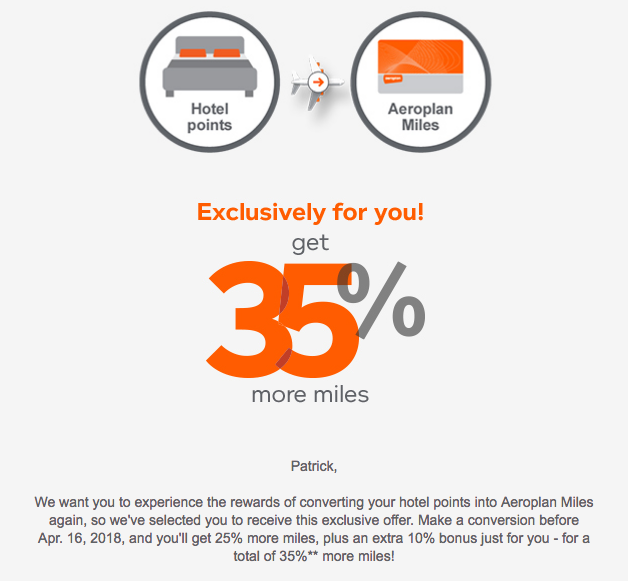 Earlier in the week we brought you the details of the new bonus for converting hotel points to Aeroplan. The general bonus offer that is open to everyone is 25% however some people, including myself have been targeted for 35% which matches the highest bonus seen on conversions from last summer. Be sure to check your email for one from Aeroplan with the subject line "This bonus is just for you," Now the targeting is behind the scene so no regsitration is required so even if you miss the email and convert you might get a nice surprise with that extra 10%. There is also some talk as to whether or not Marriott's Travel Packages will count as Aeroplan's Terms & Conditions now state that they 'might' but on the Marriott page is states 'Bonus miles from Aeroplan (Air Canada) offers are not applicable.' Anyone care to try and let us know if it the bonus pays out? The AIR MILES Reward Program is reinforcing its commitment to Canadians by offering new ways to get more from their daily spend on gas, groceries, pharmacy and more. The Program is making a series of enhancements that expands the number of Rewards requiring less than 1,000 Miles, places a renewed focus on AIR MILES Cash and offers a greater number of advantages or "show your Card" benefits through AIR MILES Perks, which provides discounts on items ranging from Canadian Hockey League games to free tickets for "Cineplex Family Favourites" movies. 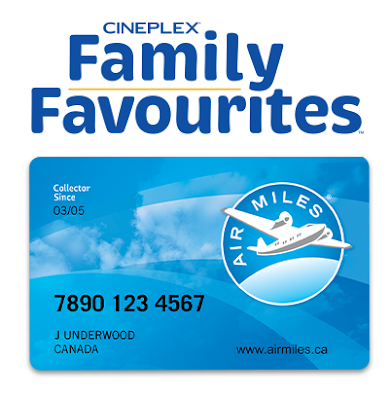 Cineplex Family Favourites – For a limited time, AIR MILES is offering Collectors promo codes to use towards free tickets to view "Cineplex Family Favourites" movies, a series of family-friendly movies screened on Saturday mornings at 11 AM at participating Cineplex theatres. Additional showings are also available during March Break, making it a great and free activity for Collectors and their families. To request promo codes, Collectors can visit www.airmiles.ca/movies. AIR MILES Perks – Collectors get rewarded for simply being a member in the Program, without having to use a single Mile. These advantages or "show your Card" benefits include 25% off regular season CHL game tickets at participating games, up to 45% off Park'N Fly at the airport, up to 25% off on day lift tickets to various ski hills in Canada and more. Rewards for less than 1,000 Miles – AIR MILES offers a wide variety of merchandise and experiences that can be redeemed for less than 1,000 Miles. Rewards include household and kitchen essentials, as well as experiences like admissions to the zoo, movie passes or tickets to shows. AIR MILES Cash – Collectors can instantly use Miles in-store towards everyday purchases like gas, grocery, drug store items and home improvement purchases at participating Partner locations. Collectors can use as little as 95 Miles to get $10 off their purchase. The big takeaways are more rewards under 1,000 miles - this is a good move as AIR MILES Reward Miles are generally not a currency that accumulate in large numbers quickly. Providing more low ticket items will let members get something from the programs. The Cineplex offer is a pretty good deal as well as who doesn't like free movies? Granted it's limited time and there are limited showings but hey if you can make it then go for it. Hertz Save 15% off the base rate* of your next weekend rental. Offers valid on rentals NOW through April 15, 2018. Find out more here.